Nissan offers their Divide-N-Hide cargo system. It allows you to create multiple levels of storage. On the bottom is a hidden compartment that's perfect for keeping valuables out of sight. The movable storage shelf allows you to maximize cargo room by utilizing vertical space in the trunk. If you're hauling taller items, you can also lower the floor for better accommodation. If you need to haul a large item, simply lower the rear seats, raise the floor, and slide it in. 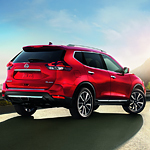 Learn about the cargo possibilities of the 2018 Nissan Rogue by visiting us at DCH Auto Group. We'll be more than happy to show you around the lineup and set you up for a test drive.